Or at least her statue turned 50 earlier this month. 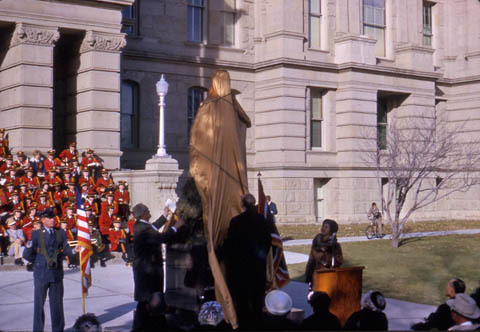 On December 8, 1963, the bronze statue of Esther Morris was unveiled in front of the Wyoming State Capitol Building. 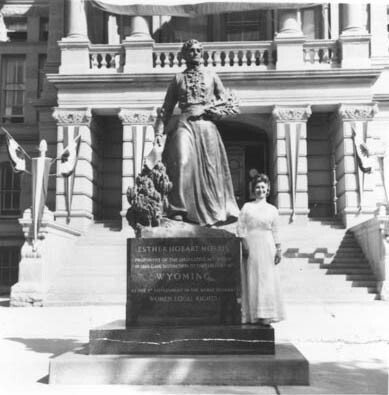 Secretary of State Thyra Thomson standing beside the statue of Esther Morris. This photo was taken during the 75th anniversary of statehood celebration in 1965. 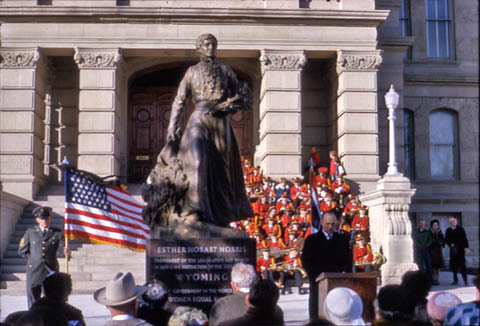 The bronze is a replica of the sculpture on display in the National Statuary Hall in Washington, D.C. Sculpted by Avard Fairbanks, the statue commemorates Esther Hobart Morris and those who worked to give Wyoming’s women the right to vote in 1869. This piece was the first to represent the state of Wyoming in the national capitol and was joined by one depicting Chief Washakie in 2000. The statue of Morris was the third to depict a woman in the statuary hall. The story of the statue starts in 1953 when the State of Washington presented their statue depicting Doctor Marcus Whitman. Apparently, it was mentioned during the presentation that Whitman and his wife had crossed South Pass in 1853 on their way to Washington. Senator Lester Hunt, the man behind the bucking horse license plate, witnessed the ceremony and the wheels began to turn. 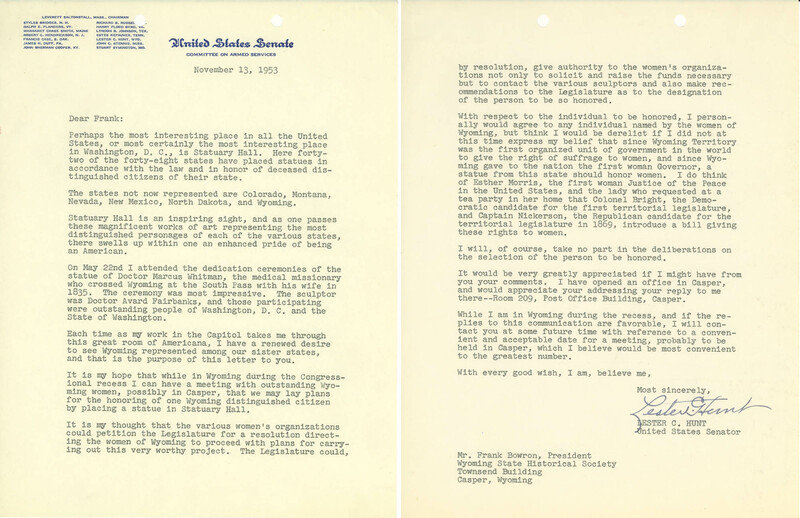 In November of that year, he finally wrote a letter to Frank Bowron, president of the Wyoming Historical Society, laying out his grand vision. Hunt’s letter to Frank Bowron. Hunt felt that the women of Wyoming would be best qualified to handle the project. Though he proposed to leave the decision in their capable hands, he did offer the suggestion that perhaps Esther Morris should be memorialized for her work in championing suffrage in the state. The official Esther Morris Memorial Commission was created by Governor Simpson in 1955, at the request of the State Legislature. The Wyoming State Historical Society asked interested parties around the state for their opinion as to who should be memorialized. Morris was by far the most popular, with Jim Bridger coming in a weak second. But not everyone was happy with the decision. Dr. T.A. Larson, professor of history at the University of Wyoming, wrote several lengthy letters to the editor of the Laramie Boomerang that were published. He believed that was little proof that Morris was as influential as folklore claimed she was. Once the decision was made to immortalize Morris, members raised the funds necessary and commissioned Dr. Avard Fairbanks, who had inspired Sen. Hunt with his statue of Whitman.The statue was unveiled in Washington D.C. in 1960 with former Governor Nellie Tayloe Ross representing the state and office of the governor. State Representative Endness Wilkinson made the official presentation. All three of Wyoming’s congressmen, Sen. Joseph O’Mahoney, Sen. Gale McGee and Rep. Keith Thomson also spoke at the ceremony. Removing the covering from the statue. Secretary of State Thyra Thomson watches to the side. In 1961, the State Legislature provided $7500 to place a replica of the statue to be placed at the state capitol building. The Commission was organized by Governor Jack Gage and consisted of seven citizens, some of whom had served on the original commission. Governor Cliff Hansen, the only male speaker at the ceremony, gives his very brief comments. According to the newspaper he “skipped all but the last paragraph of his prepared speech.” The Central High School band, who provided the day’s music, is seated on the steps of the Capitol behind him.